The room does not look anything like ot does on the site. The hotel was close to everything and had separate rooms for me and my family which was nice. The pool was easy to find and clean. Location was on point. About 100 yards from the beach eantrance. Food and shopping very close. The bed was comfortable and the room was warm. The room cleanliness was acceptable. Great central location, you can walk to many different activities. My daughter enjoyed the heated indoor pool. The room exceeded my expectations considering how inexpensive the stay was, will definitely come here again. What I liked is the beach is only a block away. Did alot of walking and I loved it. Close to everything, beach, restaurants and arcades. You can walk everywhere! The bed was great but too small.nd time i will ask for a queen size and the room only had one chair but they quickly brought us a second one when we asked. Overall good. City Center Motel Seaside This rating is a reflection of how the property compares to the industry standard when it comes to price, facilities and services available. It's based on a self-evaluation by the property. Use this rating to help choose your stay! One of our top picks in Seaside.Within a 2-minute walk of both the Seaside Beach Promenade and Carousel Mall, this Seaside motel features an indoor pool and guest rooms with free Wi-Fi. The motel is 1.5 miles from Seaside Golf Course. 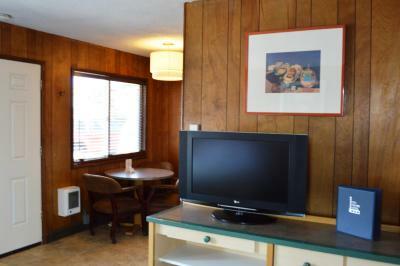 A cable TV, microwave, compact fridge and coffee machine are featured in each guest room at City Center Motel Seaside. A private bathroom is also provided. At City Center Motel Seaside, there is a 24-hour front desk. Other facilities include a guest laundromat and a vending machine. The Seaside Convention Center is a 2-minute walk away. The Factory Outlet Center Mall is a 2-minute drive away. 뀐 Located in the top-rated area in Seaside, this property has an excellent location score of 8.4! When would you like to stay at City Center Motel Seaside? Free Wi-Fi, a cable TV, a compact fridge, microwave, coffee machine and private bathroom are provided in this room. Please note that the room rate is based on 2 guests. Please see Hotel Policies for additional information. This family room has a microwave and cable TV. The main area has 2 queen beds, and there is a separate bedroom with 1 queen bed. Please note that this room is located on the 2nd floor, and there is no elevator on the property. 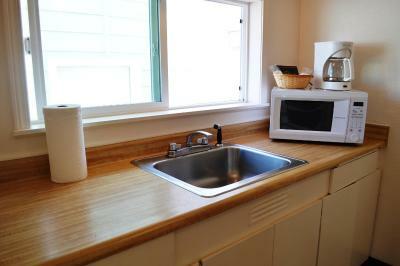 This double room features a kitchenette, stovetop and microwave. This suite has a seating area, TV with cable channels, a kitchen with a refrigerator, a microwave, a coffee machine, a stove top, and an oven, and an private bathroom. Please note this this suite is located on the 2nd floor and is accessible by stairs only. This double room features a kitchenette and a microwave. This room has a full-sized bed and a microwave. Budget friendly property just two blocks from the beach! House Rules City Center Motel Seaside takes special requests – add in the next step! City Center Motel Seaside accepts these cards and reserves the right to temporarily hold an amount prior to arrival. Your credit card will be charged 24 hours prior to arrival date. Same day reservations will be charged at the time of booking. Please contact the hotel for more details. This accommodations does not accept cash payments upon arrival. Please contact the property in advance if you plan on arriving after 22:00. Please inform City Center Motel Seaside of your expected arrival time in advance. You can use the Special Requests box when booking, or contact the property directly using the contact details in your confirmation. No place to sit down other than the bed, windows went low, so if the blinds were open passer-bys could look in. Fine for a one-night stay, but not for more. It was a very small room, but was also inexpensive for being just two blocks from the beach. Our room was on the road and next to the pool. Very noisy as the walls were thin. Furniture was worn down and the table only had one chair. 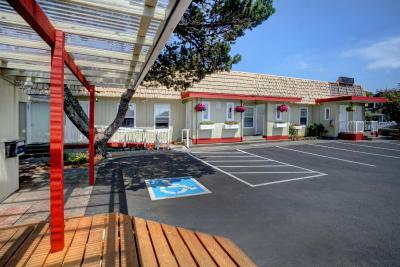 Staff were friendly, location was convenient; able to walk to beach and downtown easily. The bed and pillows were super comfy. Ok, lots if shops and restaurants near by. Close to the beach too. The WIFI cut out at times. It was dirty. There were ants in my bed. My blankets were wet. It was just disgusting and my poor kids were not happy to be there...ruined my whole trip. My boyfriend and I really disliked the bed. To talk for me to get up and on the bed. Then when I did get in the bed it felt like it was going to sufficate from it. Very expensive for 1 night with no full kitchen.